The following article appeared in the Salvation Army's magazine War Cry, dated 5th May 2012. Read through it and I'll meet you on the other side. I'm not a football fan, I'm not a fan of any sport, but let me state here and now that I am glad that Fabrice Muamba survived, both for him and his family, just as I would anybody going through that horrific situation. That said, I've got to vent a little about this article. God was looking out for Fabrice apparently. So why did he suffer a cardiac arrest in the first place, did god take his eye of the ball? They had prayed before the match, according to his father, Marcel, so excuse if I appear stupid but doesn't the whole cardiac arrest happening mid-game kind of indicate that god wasn't bloody listening? 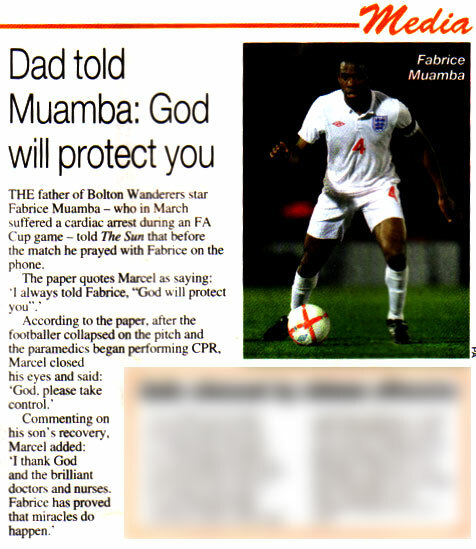 Credit where it's due, his father does thank the doctors and nurses, but alongside god. Had those doctors and nurses not been there would his son had survived? Statistically not. According to the British Heart Foundation less than 10 percent of the approx 30,000 people whom suffer a cardiac arrest outside hospital each year will survive. This chance can double if swift CPR is administered, which is almost certainly the case in Fabrice's case given the number of medically trained individuals present at a top tier football game. Even if his chances had only been 10 percent, that he survived is hardly grounds to claim it was a 'miracle', it was just statistical less likely. As to god looking after him, what of the 90 percent of those approx 30,000 people whom suffer a cardiac arrest and don't survive? Did god deem all of those thousands of people unworthy of help? What of those who weren't living glamorous luxury lifestyles for kicking a ball about but instead were working hard day in day out just to try to put food on their childrens' plates? Does god somehow see those people as less deserving of a 'miracle', he certainly doesn't appear to give a damn about them that's for sure, otherwise the statistics wouldn't be so low. What we have with Marcel Fabrice and his son is no more and no less than confirmation bias. Had his son died would he have blamed god? Almost certainly not. Thankfully that wasn't the case, thankfully medical advancements and trained professionals devoting their lives to helping others were able to save him. Shoot The Parents (or Guardian)!